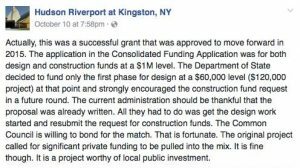 On October 11, 2015 in the Daily Freeman, an article “Kingston Seeks Public Input on Brownfield Plan” was printed/posted announcing the city initiative as well as the City of Kingston’s Hudson Riverport Facebook page that apparently had been created in 2014. That didn’t sound to us like the current office of Economic Development speaking. It is a fact that the “Hudson Riverport at Kingston” is a Facebook page created, owned and operated by the city of Kingston. So why would it suggest that “the current administration should be thankful that the proposal was already written…” for a project that it continues to organize and maintain? Curious, we looked at the ABOUT section of Hudson Riverport of Kingston NY page, and there wasn’t a description or any details connecting the page to the City of Kingston initiative for which the social media site was created for when it was set-up. (VIEW: Hudson Riverport ABOUT section). Unfortunately, we have reason to believe that the page continues to be administered by a past City of Kingston employee without having permission to do so, or without any guidance from the current Economic Development or Grants Management office. After looking around a bit more, there is at least one other just like it. An inventory of these sites needs to be collected. The good news is that the City of Kingston is currently looking into the matter and will take the necessary steps to rectify the situation. Apparently, in the past a city employee could create a Facebook page on their own, without there being a secondary employee to be included as an administrator. That has now been implemented. However, for sites created prior to 2016, if a person who worked for the city being the sole adminstrator decides to act maliciously, they might take the entire site down where information meant for the public record that was posted over the years would be lost. Lets hope that that doesn’t happen in this case. Perhaps the good news here, in an instance like this and if it ends up being what we suspect, will expose areas from past city management that must be improved. 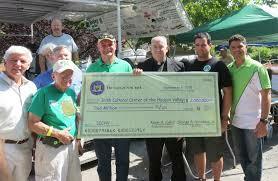 There is no doubt that successful projects is the work of many. It indeed takes a village (or a city in this case). But for City of Kingston property to be used without authority or direction is inappropriate and completely misleading to the public. Aren’t city of Kingston staff and our elected and appointed officials from both the past and present days to be working on behalf of the public good? City property is the public’s property. When you are no longer employed, elected or appointed, hand over important information in good working order so that the city can continue to run smoothly during each of its transitions. It is each of their duties to do so. READ: Daily Freeman Article, requesting comments on Riverport be sent to city-owned email address. READ: Pages 9-10 of Ec. Dev. Brochure, documenting the project. READ: Daily Freeman article about the public hearing process for the plan. VIDEO: Memorializing Resolution Passes Through Kingston Common Council Opposing Anchorage Proposal. 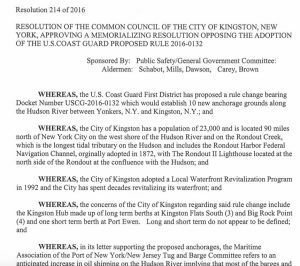 Tonight, the Kingston Common Council passed a memorializing resolution “opposing the adoption of the U.S. Coast Guard Proposed Rule” for the Anchorage project with a vote of 7 – 1 (Ward 7 Alderwoman Maryann Mills being the solo ‘no’ vote, stating she had more questions. At this time, she seemed to be supportive of the Shipping Corporations request to create 43 berths in 10 locations, opening up 2400 acres to new anchorages in some of the most ecologically sensitive areas of the river. 42 of the 43 berths are proposed to be “long term” which means that barges could anchor there for days. This is not as the vessel operators like to say as being “nothing new”. This would represent a huge increase in the anchoring of commercial vessels in the Hudson between the GW Bridge and Albany, turning our river into a parking lot for large barges and vessels while they wait for dock space to open up in Albany.) Ward 4 Alderwoman Nina Dawson was absent this evening.